was an EU-wide project for performances in the public space. It was an European large scale cooperation project, co-funded by the Creative Culture Programme of the European Union. One of its results has been a new international ensemble, made up of 30 participants from the site-specific productions initiated by the partners from 2015 to 2017. 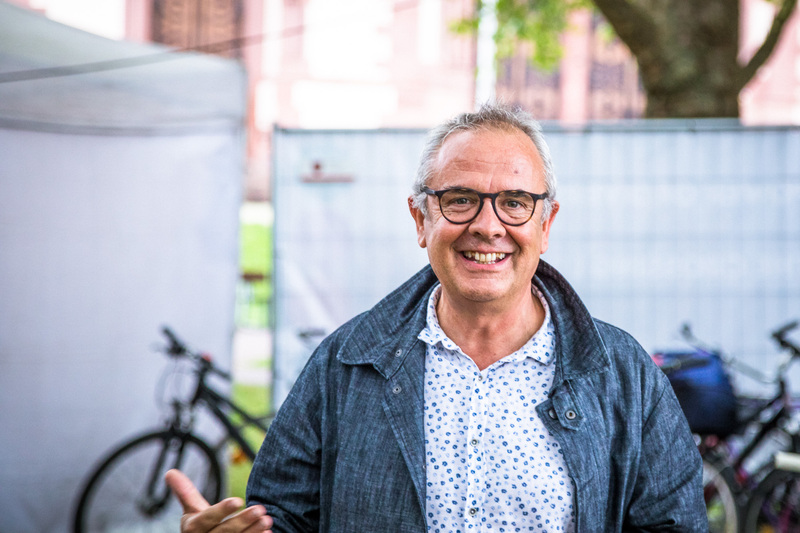 In this first phase of the project, productions for the public space were created for festivals of the ten partners in seven European countries. These performances have been developed in the corresponding cities with a focus on that city’s history, location or some other special characteristic. 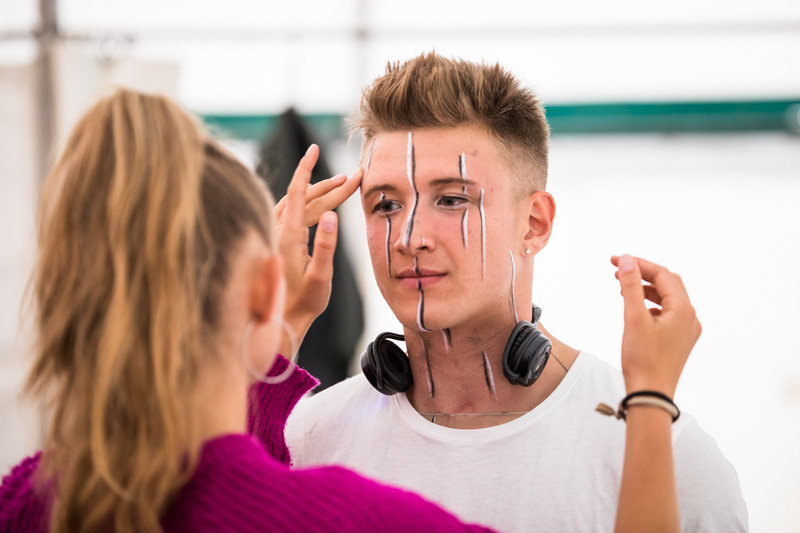 Between 15 and 40 young adults from the each city worked with the artistic direction team to develop a production in approximately two weeks’ time. 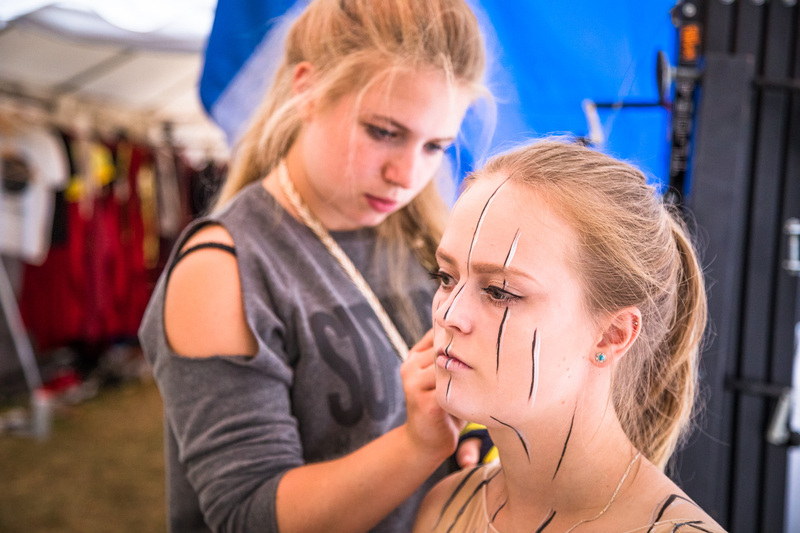 Then they presented this production within the scope of a festival or special framework programme. In addition to the forms typical for this genre (such as acrobatics and theatre), the medium of expression for the productions is primarily hip-hop, and rap (poetry slam). Up to three participants from each of the ten partner cities were chosen and invited to come to Freiburg in June/July 2017 for an intensive production phase. 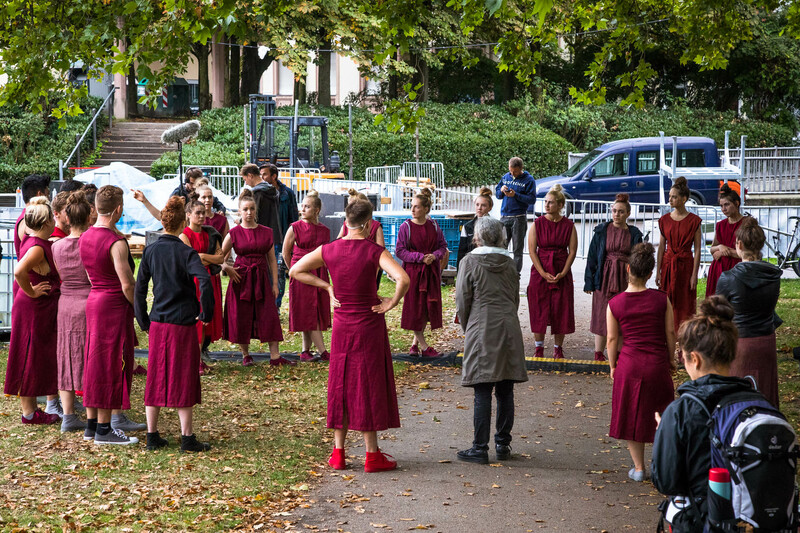 In Freiburg a large-scale venue production CROSSING LINES for several thousand spectators was developed and had premiere on 28 July 2017. 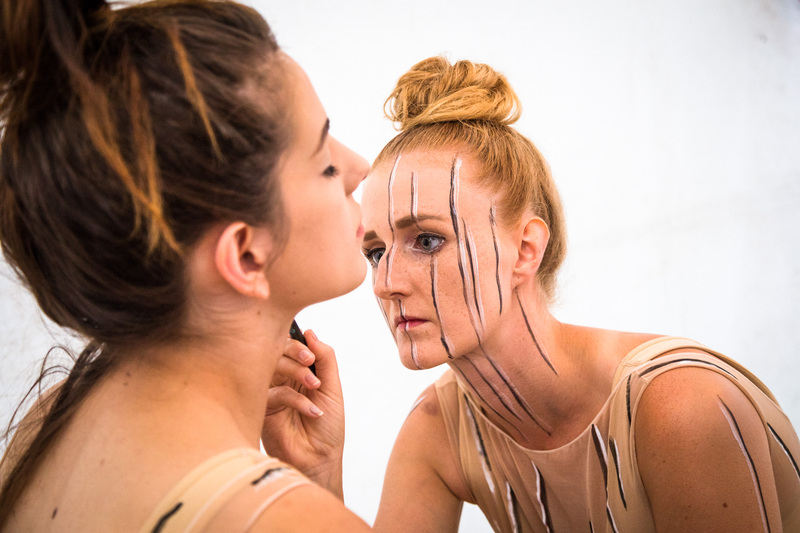 Then it went on tour to all partners, the last performance was at 22nd July 2018 in Las Palmas de Gran Canaria. Another artistical cooperation with Rapucation de Berlin. On September the 27th, 2018 the book about the project, published by Theater der Zeit Verlag was presented in our production centre in the Lokhalle Freiburg in a cooperation with the Freiburg bookshop: Buchhandlung Rombach. HERE you can find some photos of this event. On December 8th 2018, the project was presented in English by seven partizipants at the TEDx talk Freiburg. The video will be available soon. The following descriptions and videos are form the first period of the project and show the site specific performances at the partners. On Saturday, 10 June 2017, Folkestone/UK became a stage for a theatrical performance. The site-specific show, inspired by Oscar Wilde’s fantastical short story “The Fisherman and his Soul”, led the large audience through the Old High Street, a tradition-laden road in the historical city centre. Cafés, restaurants, shops and flats transformed into the stage of this piece as the audience followed the young fisherman on his travels into a strange watery world. Oskar Wilde inverted the tale of the little mermaid. In his story, the man falls in love and follows the beloved water creature into the depths of the sea. This requires that he separate himself from his human soul, who repeatedly calls out to him and tries to lure him back onto solid land. The fisherman then indeed leaves the sea in order to lay eyes on a young dancing girl with naked feet. Despairing, he returns to the sea, but his beloved dies and he lets himself be drawn by the sea into the depths. The piece poses questions about yearning, freedom and the utterly human feeling of being drawn to what is known, what is home.This work marks the end of the first part of the overall project. 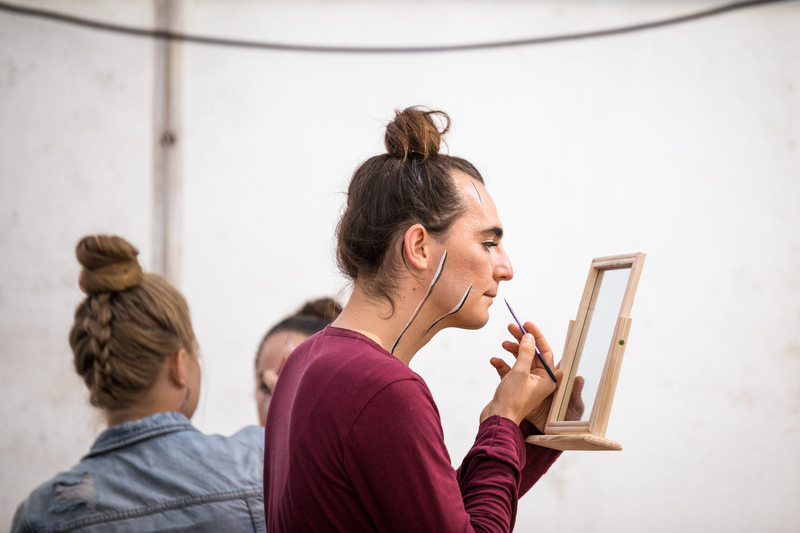 On Sunday, 18 June, all the artists selected from the European partner cities traveled to Freiburg in order to work on the main large-scale venue production. Where do we come from and where do we go at the end of our journey? In Deventer youths took the audience on an exciting adventure full of surprising moments, unexpected turns, and strange characters. The spectators were split in two groups which experienced the different episodes of the play, consecutively. Dark clowns asked them philosophical questions, a witch passed out a magic potion, and finally the buildings of Deventer disappeared among the stars in a projection. This piece made you think – not least because the audience had to solve a riddle together in order to be able to watch the finale of the show, which consisted of a dance choreography. HOCHWASSERZUKUNFT (Floodwaters Future) was the title of the performance in Freiburg that more than 20 youths from Freiburg as well as Syria, Irak, Iran, and Afghanistan worked on for several months. In this play, two groups of adolescents meet at night at an outdoor swimming pool, which they entered illegally. In ten separate episodes, they dream what their future will be like in 20 years. Sabine Choucair from Lebanon accompanied the team around director Sigrun Fritsch during the entire process and opened the programme with her Whispered Tales, stories from Lebanon as well as refugee camps from the Middle East and the eastern Mediterranean. 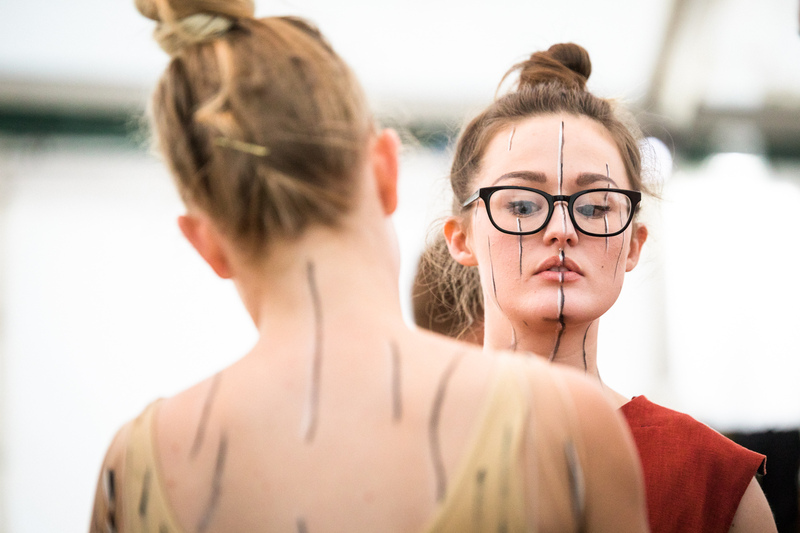 The former Airforce base Greenham Common became the location for a site-specific performance that led the audience through a post-apocalyptic landscape full of strange creatures and mysterious incidents. The theme was man’s quest for his innermost desires. The play was inspired by the novel Roadside Picnic by Russian writers Arkady and Boris Strugatsky as well as by Andrei Tarkovsky’s seminal science-fiction movie Stalker. 70 people joined this very special adventure of a night walk through the Greenham Common. An adaption of Susan Sontag’s play Lady from the Sea which was performed in and around Marienlyst Castle in Helsingør. 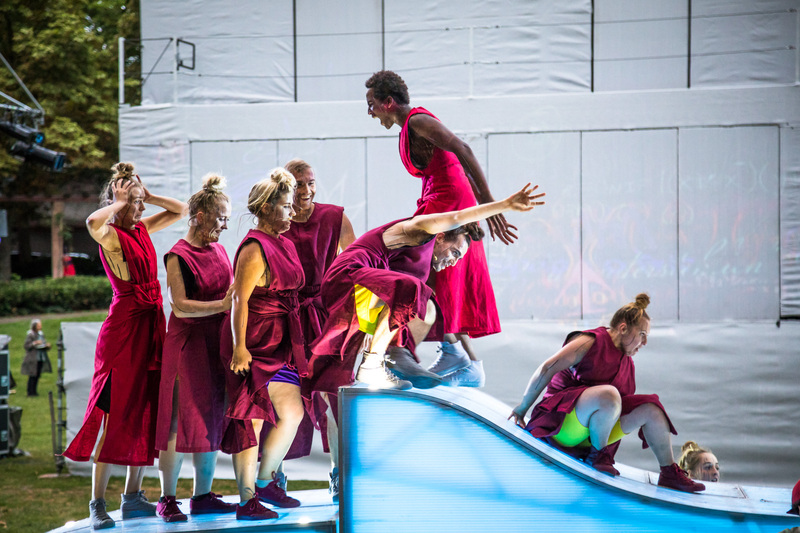 The site-specific show was performed by eight local youths and was divided into two parts, one taking place inside and the other one outside of the castle. At the beginning of the play, the audience of approximately 600 people was separated in two groups which saw both parts of the play sequentially. Then the two groups where brought together again to watch the performance’s grand finale in the castle garden. During the 2016 VIATHEA Festival, the Nicolai Cemetery in Görlitz turned into a performance venue for two very special theatre evenings. More than 20 young people from Görlitz and the surrounding area, with various nationalities (from Afghanistan, Iran, Eritrea, Syria, Morocco, Poland and Germany), moved the audience in their piece about hope and life dreams. 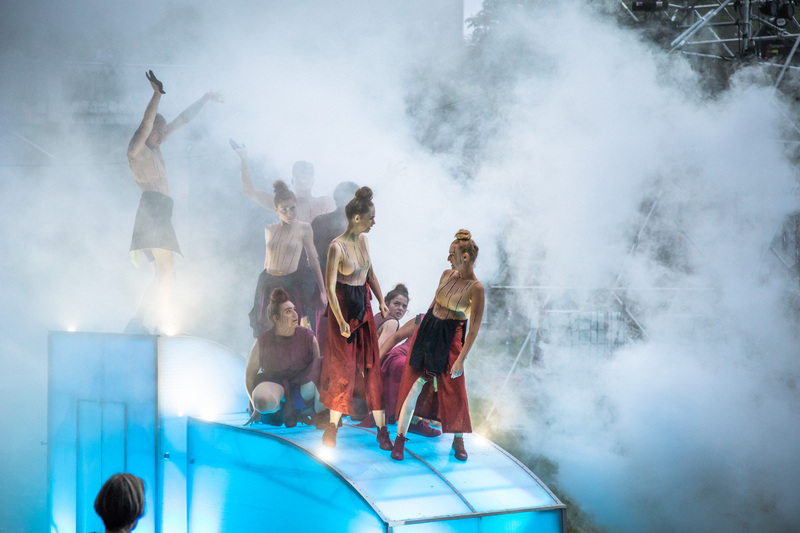 During the 2016 Sibiu Theatre Festival, the 20 dancers and rappers from Sibiu took their audience on a theatrical parcours through the historically significant Astra Park. Displaced dynamics, the title of this site-specific production, fulminated in an impressive RAP finale high up in the park’s trees. On February 11th, Crossing Lines Kirkenes had premiere at the Barentsspektakel 2016, hosted by Pikene pa Broen. 16 young adults from Kirkenes, Norway and Murmansk, Russia presented a production around the subject „anthropocene“, an expression created by the Geological Society of London in 2008. For two weeks the group worked together with the team of Rapucation and PAN.OPTIKUM at the Pasvik Folkehøgskole, near Kirkenes.